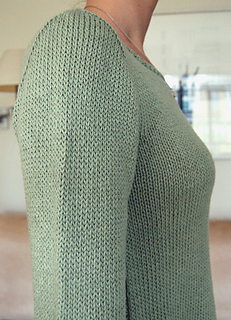 This one piece, top-down, A-line sweater, with a crew neck and bracelet length sleeves, has tapered side gussets in reverse stocking stitch. Sleeves are fitted at shoulders with optional short-row sleeve caps. 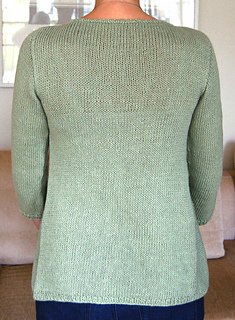 Without short rows this garment is easy. The tapered side gussets add swing to this comfortable spring sweater which is worked in a cotton/linen blend.